Death bears a certain dignity in its wake, a peacable closure, even when a person’s life has been buffeted by the crests and troughs of public life lived under a polarising glare. But not if the person in question is Jayalalitha, with claimants vying for her throne, and after a close aide is sent to jail for amassing wealth and still wants to control the party from prison. And certainly not when a roving inquiry is ord­ered into the exact cause of her death and is used to settle political scores. 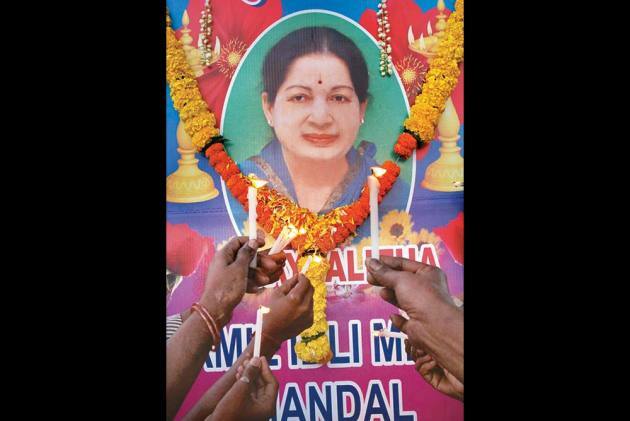 If Jayalalitha’s 75-day hospital stay before her death on Dec­em­ber 5, 2016, was marked by lies and misdirection about her medical condition, the aftermath is suffu­sed with stunning revelations. The Arumugaswamy Inq­uiry Com­­­­mission probing the treatment given to the former Tamil Nadu CM is proving to be the occasion for a public washing of dirty linen. Though held behind closed doors, regular briefings by the deponents, their lawyers or strategic leaks keep headlines boiling. The latest fusillade has seen the state’s law minister C.V. Shanmugam accusing the state health secretary J. Radha­kri­shnan of preventing Jayalalitha from being taken abroad for treatment, and warning Radhakrishnan that he could face the due process of law. This was pre­ceded by the standing counsel of the commission filing a petition that Radha­krishnan “made contradictory stateme­nts before the panel and was against tak­­ing Jayalalitha abroad....” “He speaks like the spokesman of Apollo Hospital, which speaks volumes about the collusion and inaction in the matter of treatment of the late chief minister,” the counsel said about Radh­akrishnan, an efficient IAS officer who Jayalalitha had trusted with important postings. Both Radhakrishnan and Apollo dismissed the charges, pointing out that not taking Jayalalitha abroad was a medical decision taken by the team of experts that included doctors from AIIMS and Lon­don. Undeterred, Shanmugam kept targeting the health secretary for asserting that Jayalalitha received world-class care at Apollo. He even distorted Radhakri­shnan’s passing observation that taking her abroad could be seen as an insult to Indian doctors. The state’s IAS Officers Association had to formally complain to the chief minister that an honest officer was being browbeaten for doing his job efficiently. Even Apollo complained to the panel that depositions of its doct­ors were being recorded inaccurately, especially medical terms. It sought a panel of doctors to assist the commission while examining experts, but retired HC judge Aru­mugaswamy refused, preferring to fall back on medical handbooks. According to sources, the state government is using the probe to blame Jayalalitha aide Sasikala for controlling the line of treatment and even having CCTV cameras switched off in the ward. Apollo is being targeted for latching on to its VVIP patient for monetary gains and fame—its hefty hospital bill submitted to the commission got promptly leaked. The hospital could become wary of treating VVIP patients after this experience. Officers like Radha­kri­shnan could become a convenient scapegoat if Sasikala is absolved of blame, tha­nks to her aggressive lawyer. This could, in turn, spark a bout of non-cooperation by IAS officers. “The ruling AIADMK wants to compel Sasikala to merge AMMK, floated by Dhinakaran, with the AIADMK. The commission has been converted into a handy tool for this,” discloses a senior lawyer. The commission was sought by O. Panneerselvam as a precondition for joining hands with chief minister Palaniswami. But so far, neither OPS, who was number two during Jaya’s illness nor the health minister, then a confidant of Sasikala, has deposed. Even Sasikala has not been questioned till now. Ultimately, the commission’s findings, expected by February-end, can only be recommendatory and not result in act­ual prosecution. Till then, the wrangling that goes on at the former official palace of the Arcot Nawab can only serve to feed the public various insinuations about the death of a CM who thrived in utmost secrecy.